After last week’s simple peach dessert, I wanted something more elaborate this weekend. 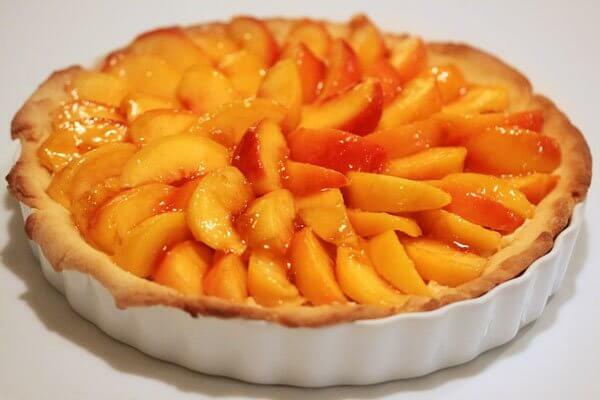 By that, I don’t necessarily mean hard to make, because this peach and mascarpone tart was actually quite simple. Actually, it came together quite easily and quickly. But the best part was that this tart was amazing! If there is any dessert that can outshine peach pie, this is it. The key is the layer of mascarpone, sweetened and flavoured with orange zest, then lighted with whipped cream. The tart shell is blind baked, and can be made well in advance. I also mixed the mascarpone, orange zest and sugar in advance, so the only steps left were to fold in the whipped cream and arrange the peach slices. There’s no baking required after assembling, so unlike a pie, it’s ready to serve right away. (Although ideal if you chill it a bit to firm it up.) The perfect dessert to impress for a late summer dinner party.